The flood gates have opened up to all customers who wish to scope out one of the next big things to come out of Android land. 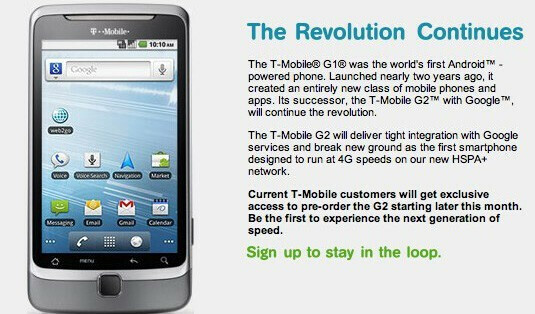 T-Mobile is now allowing just about anyone to grab themselves a highly prized pre-order for the T-Mobile G2 which is scheduled for release this October 6th – so make sure to mark your calendar. With less than 2 weeks before the big day, there surely will be plenty of anticipation during the wait time – but with most things, it will be more than worth it. Just remember that pre-ordering the smartphone before October 4th will guarantee you a shipment date by October 6th. Naturally, you'll have to shell out $249.99 upfront to scope a pre-order, but you'll get back $50 in the form of a mail-in-rebate – taking its price to the sweet spot of $199.99 with a contract.